Dr. O'Driscoll presents his award-winning non-fiction book, Not Yet, at the Best of State Utah Awards Gala in Salt Lake City. 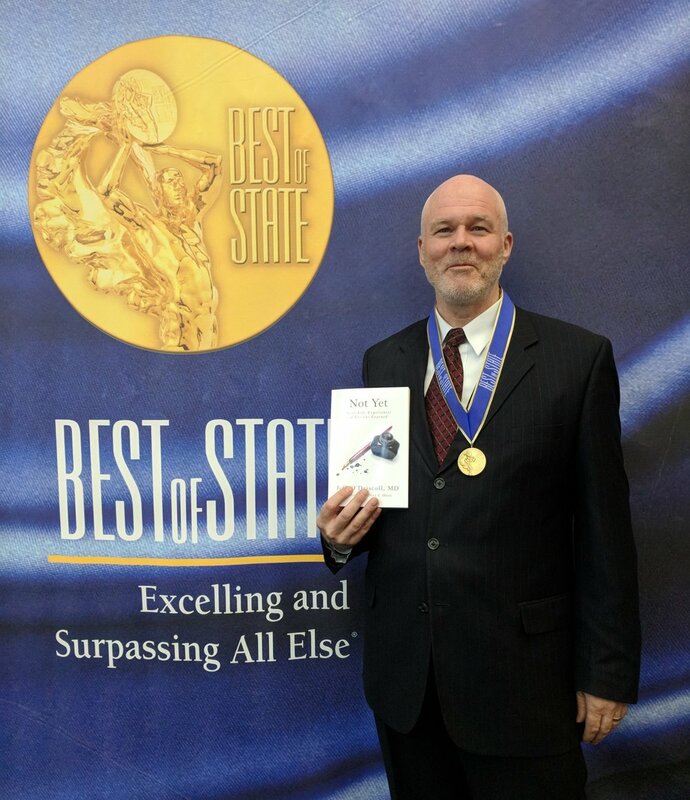 Salt Lake City, UT, May 18, 2018 – Jeff O’Driscoll is honored to announce his self-published work, Not Yet, was awarded the Non-Fiction Best of State award for Literary Arts on Thursday evening at the annual Best of State Utah Awards Gala. The evenings’ event took place at the Salt Palace Convention Center in Salt Lake City. Not Yet grabs highlights from Dr. O’Driscoll’s twenty-five years in the emergency department and walks readers through a series of near-life experiences that open a window into a spiritual world. O’Driscoll invites willing souls beyond the veil and into a fuller, more inspired life. The Best of State Awards were created to recognize outstanding individuals, organizations and businesses in Utah. Best of State winners are selected based on excellence in their endeavors, using innovative approaches and methods, and their contribution to a better quality of life in Utah. Jeff will next appear on Park City Television Mountain Morning Show on Monday, May 21, 7:00 – 9:00 am (Live appearance at 7:40 am) to discuss his acclaimed book, Not Yet. Jeff O’Driscoll, MD, grew up in the beautiful mountains of rural Utah and enjoys expressing his personality through art and literature. Jeff practiced emergency medicine for 25 years and recently took a leave of absence to pursue consulting and writing. He has published works in theology, ancient scripture, history, medical science and administration, fiction and non-fiction. Jeff resides in Salt Lake City, Utah, with his wife of thirty-two years, Sheila. They have five children and three grandchildren.